Kidneys are important organs since they help expel waste from the blood and maintain balance of minerals and fluid within the body. Conditions affecting the kidneys are referred to as kidney diseases . Kidney diseases are not only confined to human beings. Your feline friend could also fall victim to them. The best way to prevent kidney failure is to detect such conditions well in advance. Unfortunately, symptoms only start appearing when 75% of the kidney function is lost. If you detect kidney diseases in your cat, here are some tips on selecting cat food for your sick friend to aid in its recovery. Protein is used as a building block to make up the body and help it function. Protein has to be broken down in order to be used in the body. This process involves the release of toxic byproducts, which are then expelled through the urinary system. When the kidneys no longer function as they should, they are unable to expel the toxic byproduct of the protein breakdown process. This leads to the accumulation of toxins in the body affecting the wellbeing of your cat. A low protein diet is therefore ideal. Since cats are obligate carnivores, they have to eat a diet composed of protein and fat. Cat food for kidney disease should contain high quality protein in lesser amounts, so as to reduce the production of toxic waste. Consuming large amounts of phosphorous can lead to renal failure in cats. It is, therefore, advisable to reduce the amount of phosphate content in your cat’s food to help slow down the progression of kidney disease. By reducing the phosphate content, you also help reduce the incidence of renal secondary hyperparathyroidism, a secondary syndrome associated with kidney disease. It also helps reduce the chances of calcification of the kidneys and other body tissues. 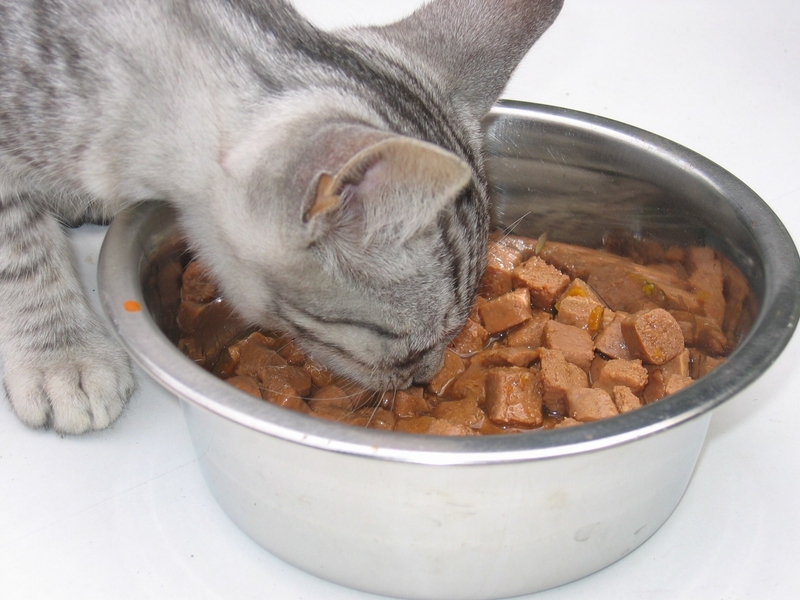 When compared to dry food, canned pet food has higher water content. While canned food contains 70% to 80% moisture levels, dry foods have only 10% to 12% moisture levels. If you are feeding your cat on dry foods, they are more likely to get dehydrated. Canned food will help increase the daily water intake of your cat, and help prevent and deal with kidney diseases. Sodium levels in the body play a role in the maintenance of blood pressure. Strive to keep the sodium levels in cat food for kidney disease at between 0.1% to 0.5% on dry matter basis. Omega-3 fatty acids should be included in the diet of a cat with kidney disease. They help decrease inflammation and help with kidney health. The group of B vitamins is usually expelled from the body through urine as they are water soluble. To compensate for this loss, make sure you increase your cat's intake. Make sure cat food for kidney disease contains antioxidants to help prevent cell damage and improve the immune system of your cat. Some of the antioxidants you should look out for include: vitamin C, vitamin R, lutein and beta-carotene. Choosing the right food for a cat with kidney disease can be a daunting task. Here are some pet foods you can find in your local pet store and a breakdown of what they contain. There are supplements that can help with some of the functions cat food for kidney disease provide. For example, Ipakitine, a phosphate binder, binds to dietary phosphate and allows it to be expelled through faeces instead of urine. You can also get potassium supplement for your cat if it is the cause of the kidney problems. You should consult your vet before you put your cat on any supplements. You should make the diet change gradual. If necessary make the change over a few weeks so that your cat doesn’t get fussy. You can start off by mixing small amounts of the new food with the old food. Once your cat has adapted to the mixture, start increasing the amounts of the new food gradually while decreasing the old food. You can increase palatability by warming the food to room temperature. If your cat is struggling with the new regime, talk to your vet about using drugs to increase your cat’s appetite and make the transition easier. Cats with kidney disease often do not take enough water to compensate for what they lose in the urine. This means that you should take measures to stem dehydration. Make sure your cat has an adequate supply of water throughout the day. Encourage the cat by serving water in different bowls. You can also use flavored water e.g. tuna or chicken flavored water. Another strategy would be adding water to the cat’s food. Water can also be introduced intravenously by your vet in extreme cases. Mix tuna juice, water, clam juice, beef broth or chicken broth with any of the foods to improve flavor. Make sure you do not add salt. Cats only eat what they can smell. Add a drop of oil from a can of anchovies to make the food more appealing to the cat. Coax the cat into eating by stroking it, sitting with it and taking to it. Offer a plate of food or even try to hand-feed it. You can “jump-start” the cat by putting food on its paws or mouth. If your cat is a nibbler, you should keep the food palatable and fresh by feeding it small amount at intervals. Server responsed at: 04/22/2019 2:04 p.m.